Logan to Darwin Removalists, that’s what we specialise in, but it can leave you somewhat perplexed and overwhelmed, especially if you are a novice. With over 20 years of trusted interstate removalists expertise, Roadway Removals is more than qualified to assist you with a smooth transition. We pride ourselves as being one of the most reliable and customer-focused interstate moving companies in Australia, so you can have confidence in the exceptional services we deliver. Roadways Furniture Removalists is one of the premier furniture removals companies in Australia; we have built a reputation for matchless service quality over the years that our countless clients will be happy to vouch for. While we will be happy to help you out with local removals, our strength is in long distance and interstate removals; we have got virtually every destination on the map covered and run regular services between the more popular cities. Storage: We offer you the convenience and security of storage units at strategic locations all over the country. These units are secure and offer a choice of access frequency to best fit your budget. 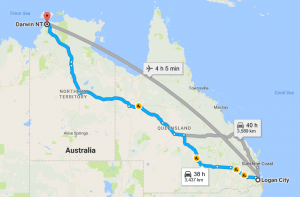 If you need reliable Logan to Darwin removalists, Roadways Removals is ready to get the whole process on the way today!